This is where the touch of luxury is found in every detail. Welcome to 9055 Dayton Avenue Richmond single family homes for sale. One address with 23 unique homes located in an exclusive residential enclave in the highly sought after Broadmoor Richmond area. 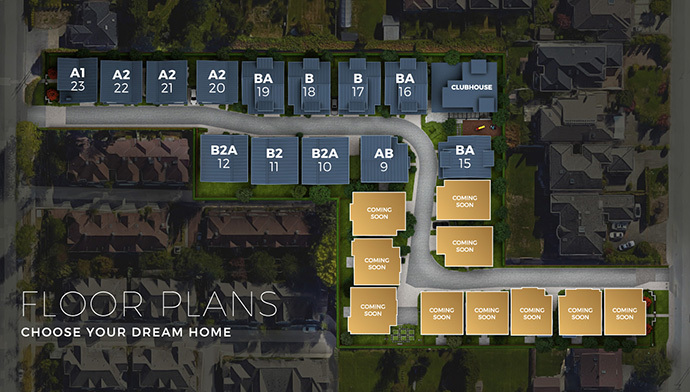 These detached individual strata homes are thoughtfully designed by Jacken Homes and Taizo Yamamoto and families will be very close to the top ranked schools, great shopping, endless amenities and international cuisine. This is the ideal neighbourhood for families. The unique and modern West Coast architecture at 9055 Dayton Avenue Richmond homes for sale is timeless and the premium materials and finishes are unlike any other development in the city. ONE ADDRESS – ONE GOLDEN OPPORTUNITY. Where the touch of luxury is found in every detail. Modern West Coast strata houses with a private clubhouse are coming soon this fall to Richmond. The 9055 Dayton Avenue Richmond homes feature 3 and 3 bedrooms between 2,066 to 2,574 square feet. Please visit www.daytonavenue.com for all the details or you can simply register at the top of this page for more information. There are two distinct and beautiful colour schemes to choose from. In addition, spacious and well appointed bedrooms in addition to luxurious spa inspired bathrooms are presented here at Dayton Avenue homes in Richmond BC. The European inspired master ensuites features double deluxe vanities with plenty of storage, sleek Italian made faucets, Gessi rainfall showers, undermount Duravit sinks and extra large deep soaker tubs. European ceramic floor and wall tile work create an elegant space that is perfect for unwinding. The heart of the home and the life of the dinner party is in the kitchen. Preserving food since 1945, Sub-Zero is recognized world-wide for its innovative and superior refrigeration technologies. Their dual refrigeration system keeps everything fresher, longer. 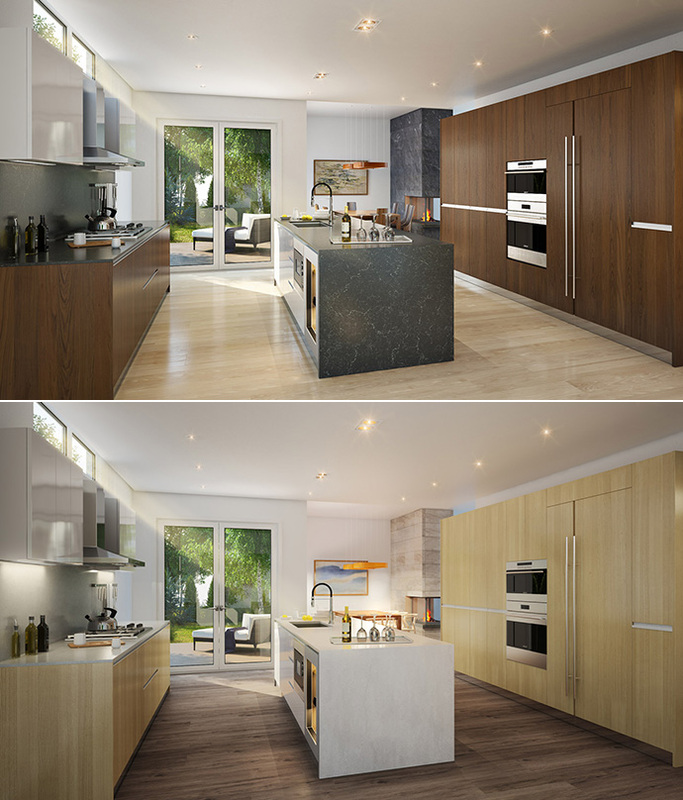 Combined with sleek, stainless steel fronts, these refrigerators are a must for Dayton Avenue. Trusted by professional chefs for over eight decades, this iconic brand brings culinary sophistication to Dayton Avenue Richmond BC. Enhance your home cooking experience with the power and precision of Wolf cooking instruments. Spain-based Porcelanosa is a leading manufacturer of wall and floor ceramic tiles with over forty years of experience. Always advancing, Porcelanosa launched Gamadecor, Spain’s first manufacturer of kitchen furniture. The hallmarks of quality found in Porcelanosa’s products are ever present In Gamadecor kitchens, where aesthetics and functionality come first. Founded in 1987, Caesarstone is a pioneer in the world of natural quartz surfaces. Their unique products feature unparalleled physical properties. Each exquisite surface is beautiful to behold, and the nonporous nature of the product makes it stain, scratch, and heat resistant. 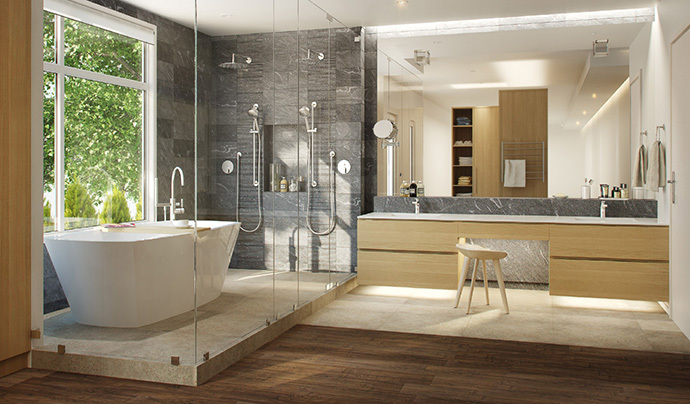 Gessi designs and manufactures exceptional bathroom fittings and furnishings. Each piece is carefully crafted in Italy, using advanced technology and minimal environmental impact. Acri-tec, a locally owned and operated Canadian company, only uses cast acrylic in the manufacturing process of their bathtubs. The result is a surface that maintains its quality and will not wear over time like fibreglass. Lutron has been creating lighting control systems for over five decades. Today’s state-of-the-art lighting and blind systems will allow you to control your indoor lighting environment with ease and reduce power consumption with built-in energy-saving functions. Further home automation expansion is optional at 9055 Dayton Avenue Richmond homes. 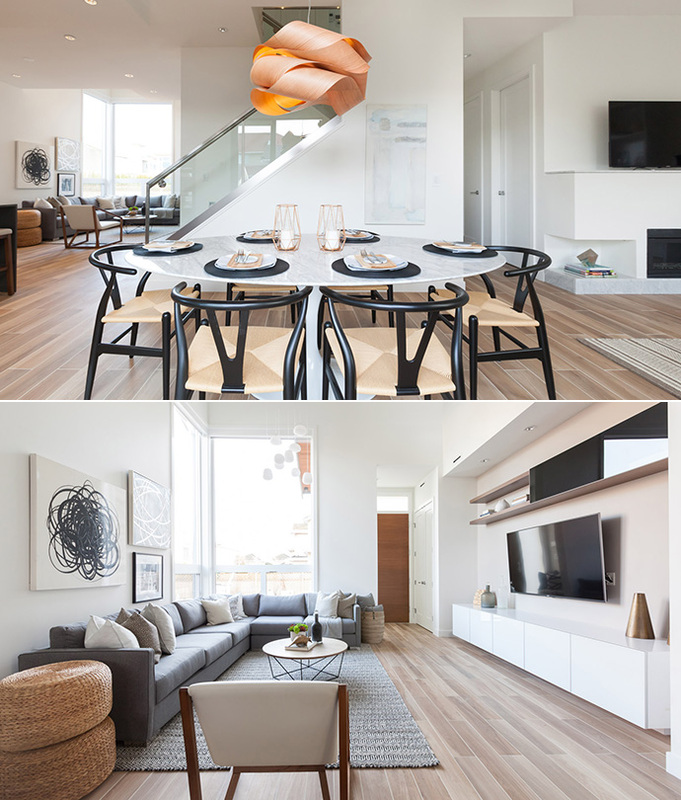 Dayton Avenue’s private clubhouse provides an inviting destination for neighbours to gather together and socialize or relax and entertain. Hosting is made easy with a gourmet kitchen, luxurious lounge and expansive patio with built-in gas barbecue. You can even plan a movie night in the multi-media room complete with a 120” HD projection screen and surround sound. Work on your fitness routine in the fully-equipped gym – a monthly club trainer is available to help tailor a personal fitness plan. Enjoy the library room, stocked with a selection of games and books.